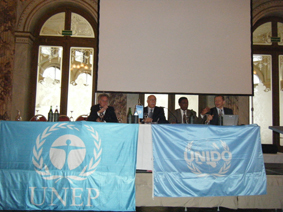 The LCPC participated in the 2009 Meeting of the on “Resource Efficiency and Cleaner Production in Developing Countries and Transition Economies” in Lucerne, Switzerland from 20-23 October 2009. As successful outputs of the Meeting and based on tough lobbying, we achieved to add the Arab Region to the charter and hereby include 5 regions instead of 4 and than to be elected in the Executive Board for RECP to represent the Arab Region. The LCPC was chosen to be the regional representative of the Arab Region/ West Asia in the 10 Year Framework of the Marrakech Process in New York.